When the first Sacred Heart Church burned to the ground, its first organ was lost, too, so the selection of a new organ was part of the planning for the new cathedral. Bishop McGolrick’s journal indicates that originally an organ was to be installed in the choir loft of the east transept, with the pipes standing alongside the stained glass window there. During the next two years, however, the bishop changed his mind about the location as well as the builder of the new organ. 27th Sept. ’97… Made agreement with A.B. Felgemak(r), Erie, Pa. — to put up an organ (No. 12) in catalogue for $3,000 —- $2,000 cash and the balance 3 months after accepting organ. July ’98 … The organ came and organ builder set to work on gallery near the door. The organ takes up much of the gallery and appears to be very fine. The water motor to cost a large sum, so we try hand power for awhile. In 1960, Milwaukee organ technician Norbert Berschdorf made major repairs to the Felgemaker. The entire instrument was taken to a room in the Grade School where it was completely overhauled. 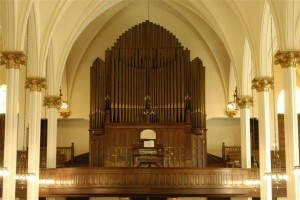 All pipes were cleaned, and deteriorated parts were replaced; new tuning rings were installed on all metal pipes up to 4′; and the whole organ was regulated and tuned. Again in 1979 the organ was partially disassembled, cleaned, repaired, reassembled and tuned by Mr. Berschdorf, thanks to the generosity of Mrs. Morris J. Opsahl who donated $6,000 for the work. 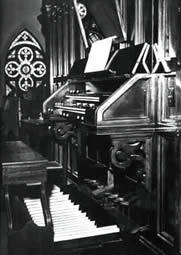 Dr. Jean Swanson, a local organist and educator, documented the quality and significance of the Sacred Heart Felgemaker organ in the Spring 1981 issue of The Tracker (journal of the National Organ Historical Society). The organ, Felgemaker Opus 664, remains almost unchanged in the back gallery where it was installed years ago. Needed alterations have been largely mechanical and have not affected the tonal qualities of the organ. The sforzando pedal was disconnected [in 1936] to provide needed space behind the pipe facade. A slightly concave pedal board has replaced the original straight one. Although the “bellows signal” drawknob remains on the console, the hand pump, long since removed and lost, has been replaced by an electric motor. The organ is in good playing condition except for occasional tuning problems in the Oboe and Bassoon rank. A two-manual 26-rank organ with 1,493 pipes, the Sacred Heart organ is among the last trackers built by Felgemaker. It is one of the few surviving organs with Barker levers which facilitate playing when the manuals are coupled. Another somewhat unusual feature is the trumpet rank with its nickel plated shallots designed to keep reeds free of dust and other foreign materials. The overall tonal quality is greatly enhanced by the excellent acoustics of the building, as well as by its placement in the back balcony.